You have to feel a little bit sorry for Scott Lang, because as heroic destinies go, he was dealt kind of a duff hand; but like all eternal chancers and hopeless optimists, he wasn’t about to let that get in the way of him playing in the big leagues. And almost as soon as he got there ,shoulder-to-shoulder (or more accurately on their shoulders, as being Ant-man, he was usually teeny-tiny) with the rest of The Avengers, he was killed. By one of his team mates. Like I said, you have to feel a little sorry for Scott Lang. But that was then, and this is now and like so many others before him, Scott is back from the dead and he’s determined to do things right this time. Well, as right as an ex-con, divorced, single father with no job and no prospects who has unexpectedly returned to the land of living with only an exo-suit that allows him to shrink to the size of an ant (and communicate with them) while retaining the relative density and strength of his full size self, to his name, can do things. 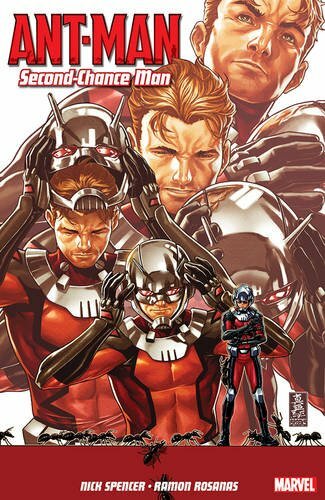 The world may have changed since he last walked in it, but as far as life is concerned, it’s business as usual for Scott Lang. With ‘Second-Chance Man’, Nick Spencer achieved the nearly impossible and made me like Scott Lang, made me take him seriously, as both Ant-Man and the hard-pressed, fighting-to-stand-still-in-modern-society man who’s just trying to do the right thing by himself, his daughter and his new employees. Bursting with black humour, ‘Second-Chance Man’ see’s Scott turn down a high profile job with Tony Stark in order to start his own security consultancy in an attempt to play a larger role in his daughters life, but his path to success is filled with unexpected pitfalls and dangers, and he finds himself battling Nazi killer robots, his old arch-enemy who it turns out was never his arch enemy, bankers, a super-villain who (in case of mistaken identity) hunts him down in order to extract his revenge before finally coming face-to-face, again, with the man who originally forced him to become Ant-Man, Darren Cross. After all, if Scott can come back, why can’t Darren?